Pan-Roasted Swordfish with Mixed Peppercorn Butter. Wholefoods had swordfish on sale for $8.99 lbs and we bought a bunch. love out food saver we divided up and stored some in the freezer. I took a piece out in the morning and on the way home stopped at Shaws grabbed a lemon and some fresh parsley. 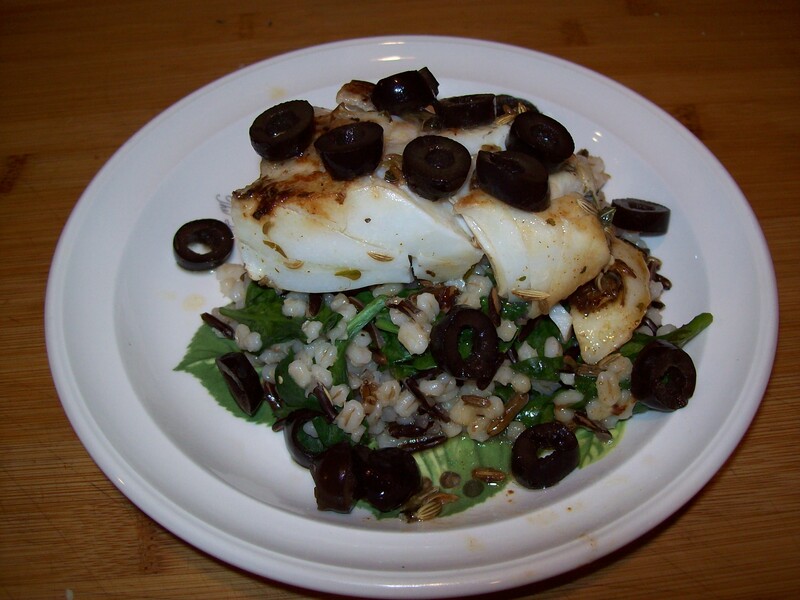 I had always seen recipes that oven roasted swordfish but was partly afraid to try because with fish a few minutes to long and you end up with a dry fish. The other reason was out of respect for my Mom who always soaked in grapefruit juice, she said this was a trick she learned from Legals, who now if that was true or a MOMism. Tenn she would coat with mayo and grill. this has been my standard way for many years I might add some Mrs Dash rub for different flavors before the mayo went on. Anyway with a quick google I saw this recipe search among a bunch and my stomach growled. yep that was the one. Got to tell you this was great I only had 1 lb so I cut the butter mixture in half. This fish melted in your mouth heck i ate 1/2 pound and eyed Lyn’s leftovers. I had to use their picture because we were so hungry i forgot to take a picture of the end results, which was pretty close I might add. Side note I’m starting to love my new cast iron pans. Preheat oven to 400°F. Mash butter, parsley, garlic, 1/2 teaspoon ground mixed peppercorns, and lemon peel in small bowl. Season to taste with salt. Over all this was wicked easy to prepare and cook. definitely a repeater. Skip the takeout and try this paleo-friendly cauliflower shrimp “fried rice” recipe! You won’t believe how easy and flavorful homemade Chinese food can be. Lyn read the caption looked at the head of cauliflower and instead of making our standby cauliflower pizza crust she thought with Josie coming this would be a good thing to try. I came home to most of the ingredients layout and a smile on her face…I thought this would be a good thing to try. Off to the train station as the last passengers strolled by memories of the last time we went there to pick her up rose. Josie and Maria on their way back from a DC visit thought her stop was the last stop and as we stood at the 3rd from last stop watching the train pull away and watching the last of the passengers stroll by. Anyway with much to do we ended up chasing the train to South Station where customer service called us because Josie’s battery had died. Not this time we called, phone worked and she was in the elevator, all was well at least in our little corner of life. Oh ya back to the food, although I had to make a few substitutions this was really good, had tried others in the past but most used a lot of Soy sauce for flavor and very little spice. This was definitely an improvement thanks. 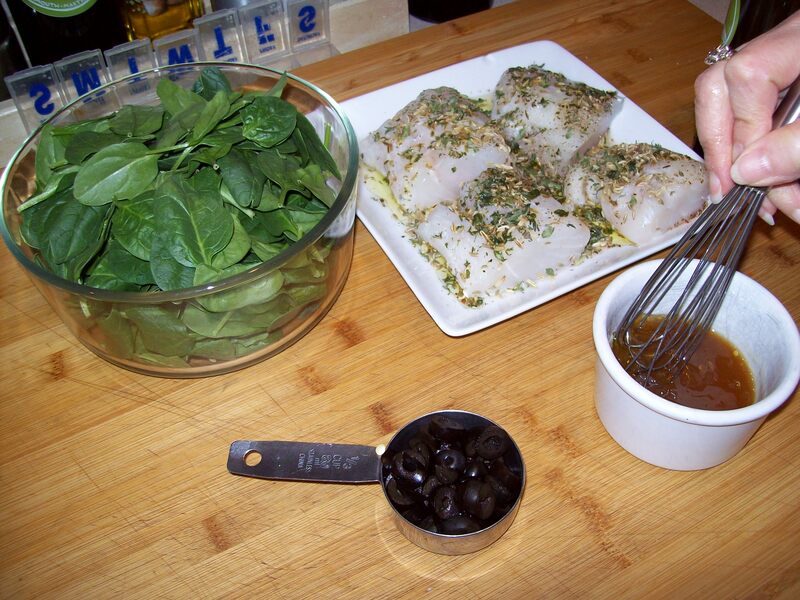 Heat a large, deep pan or wok over medium-high heat and spray with cooking spray. Season shrimp with ¾ teaspoon of the salt and the pepper before adding to the hot pan. Cook shrimp in an even layer, turning once, until pink (about 90 seconds per side.) Remove cooked shrimp from the pan and set aside. While shrimp is cooking, rice the cauliflower using a food processor, blender or a cheese grater; set aside. Whisk together eggs and remaining ¼ teaspoon salt in a small bowl. Spray pan with more cooking spray then reduce heat to medium. Pour eggs into the pan and cook, stirring frequently, 1-2 minutes. Remove cooked eggs and place in the bowl with reserved shrimp; set aside. Add diced onion, scallion whites, carrots, peas, garlic, and ginger to the pan and cook until soft and tender, stirring frequently. This should take 4-5 minutes. When veggies are cooked through, add cauliflower, soy sauce and rice vinegar to the pan. Stir well to combine then walk away for a few minutes so that the cauliflower can start to cook and create a nice crust. Come back, stir it around then walk away again. The flavor comes from letting the cauliflower brown a bit and become crispy. This process may take up to 10 minutes. It’s worth the wait! Add cooked shrimp and egg back to the pan and cook until warmed through. Drizzle with toasted sesame oil and garnish with scallion greens and Sriracha to serve. We had never made Poached Salmon so as Lyn looked over some recipes, I texted My Brother Mike. He hates salmon but Nancy loves it and being a good partner he makes it for her all the time. he texted back ” Very Simple. I put a small amount of lemon juice and water in the pan. Put salmon in pan. Sprinkle it with no salt pepper mix . Cover. Steam on low for about eight minutes or until done.” I relayed the info to Lyn but when it came time to do it we changed a few things and forgot to cover. Cam out great in fact made it again mid week. 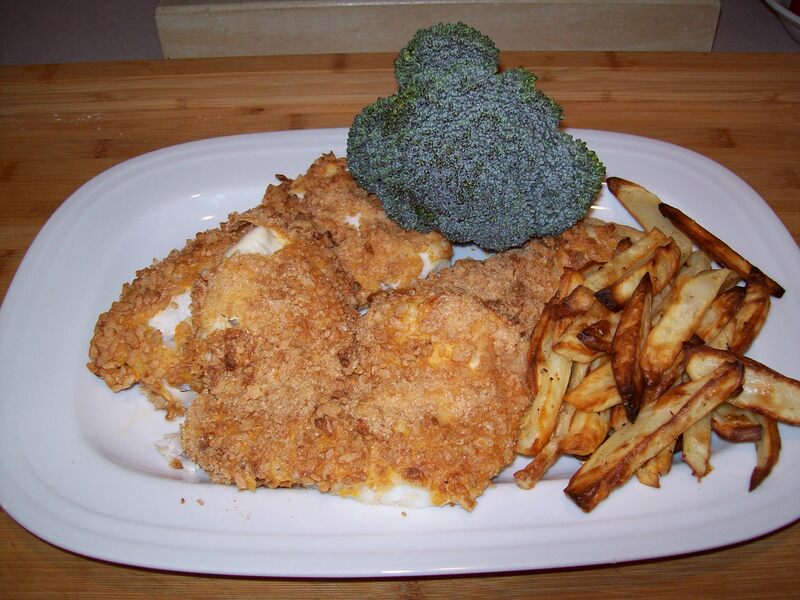 This is a quick delicious meal. 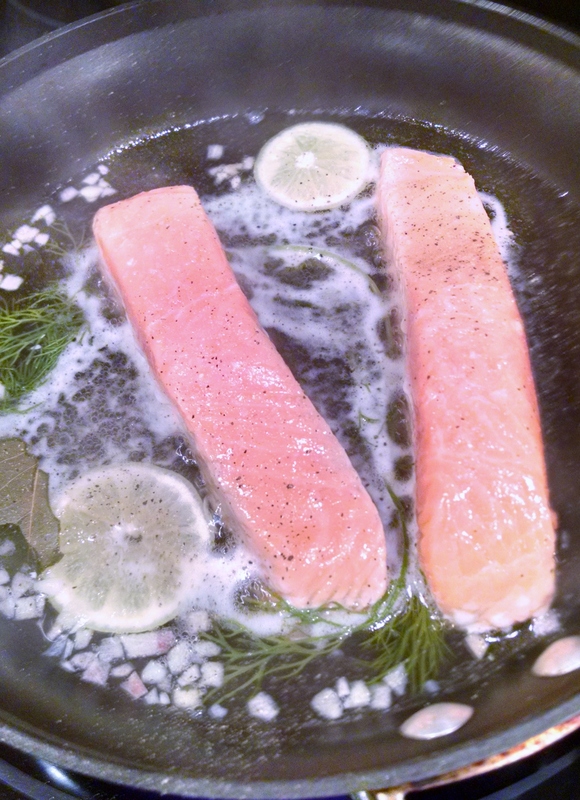 What we did was put some dry white wine, a little water, sliced lemon, fresh dill, chopped shallots then put salmon in. brought to a simmer and cooked about 10-12 minutes. I suppose it would have been faster with it covered. SO funny Lyn asked and my memory being what it is I said no. We all liked it, I was not hungry but tried a piece which ended up being a whole serving. Mike was some and had some later he had his stamp of approval. 1 Cup Gluten-free panko bread crumbs, divided. Using the panko breadcrumbs instead of regular ones gives these patties and extra crisp coating and there is no need to fry them in oil. In processor, puree the first 4 ingredients: transfer to bowl. Stir in the crab, w 2 Tbs. lemon juice, 2 tsp. 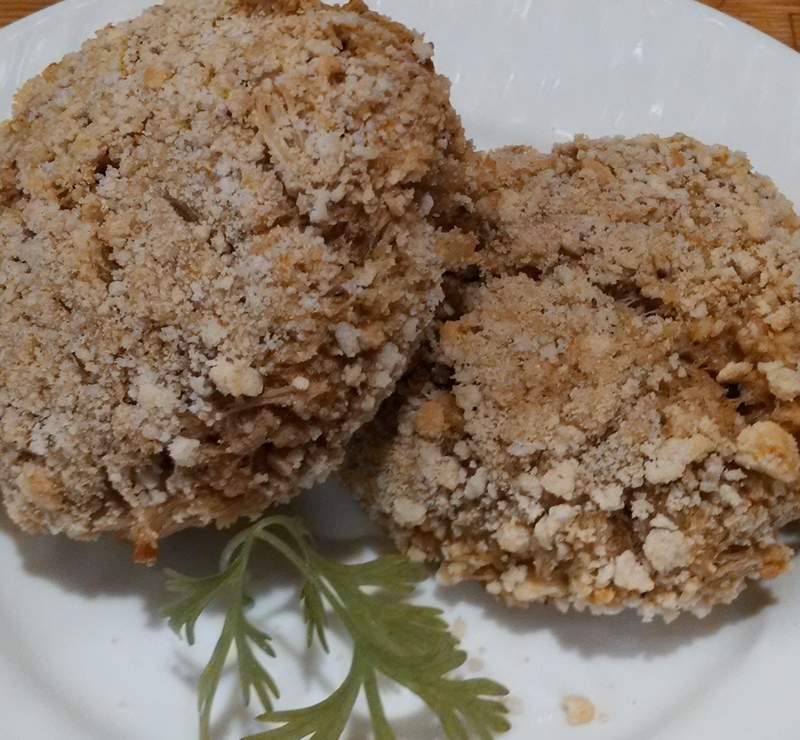 lemon zest and ½ cup panko crumbs, Shape into 8 patties. 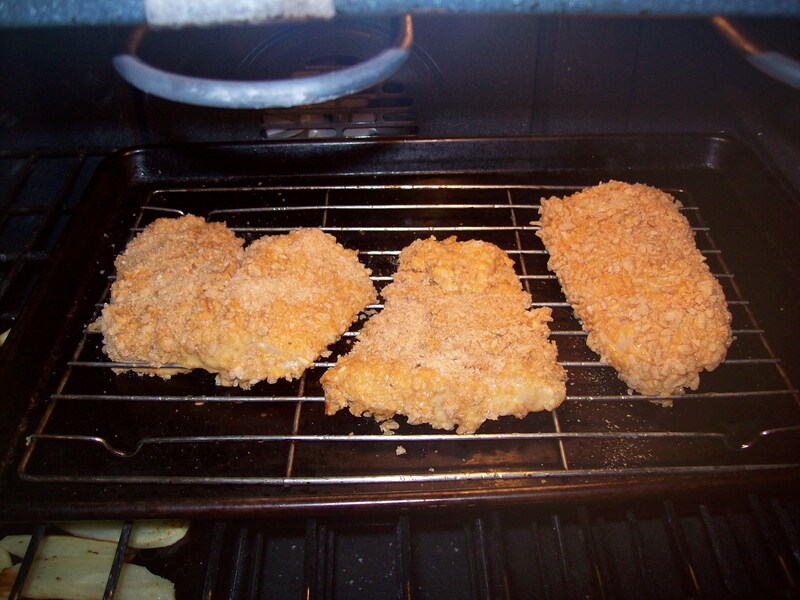 Heat oven to 400, Coat the cakes with remaining panko; place on a greased baking sheet, Coat with cooking spray. Bake 12 minutes or until done, turning once and coating again with cooking spray. Wholefoods had cod on sale so Lyn grabbed a nice piece and a searching we did go. Search for a nice recipe and we found one on gogee.com We did not have all the ingredients so we substitutes as needed I kept their recipe as is because this is definitely one we plan to revisit. I give the credit of this meal to Lyn she made the whole thing I was the helper. 1 meyer lemon (organic lemon or orange may be used, if not available) – Steve: had only fresh squeeze citrus juice no lemon or oranges around. I know Lyn without Meyer lemons hard to believe right? 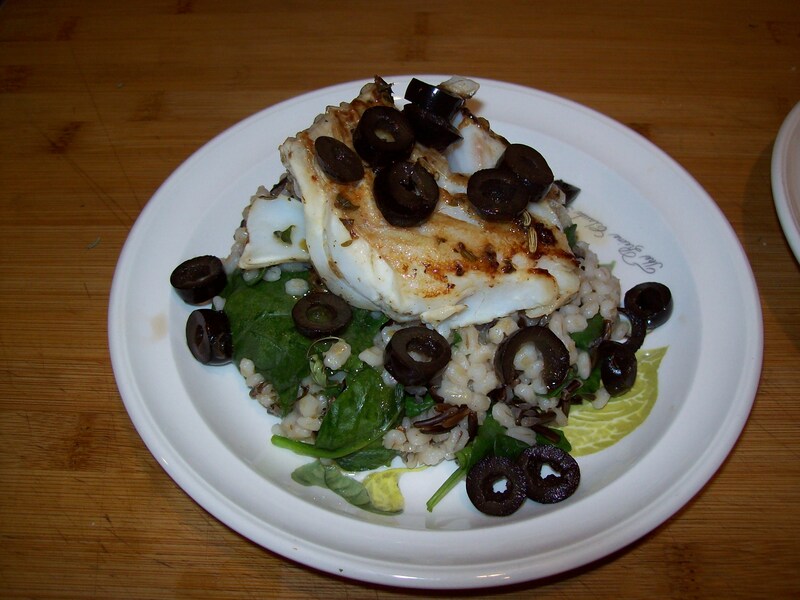 Drizzle 1/2 tablespoon olive oil over cod. Sprinkle crushed fennel, thyme, sea salt and pepper over each. Rub to coat evenly and set aside. In a small ramekin, combine the juice of the meyer lemon, 1/2 tablespoon olive oil, honey, salt and pepper, to taste. Set aside. Heat a large skillet over medium-high heat. Once hot, add remaining 1 tablespoon olive oil. 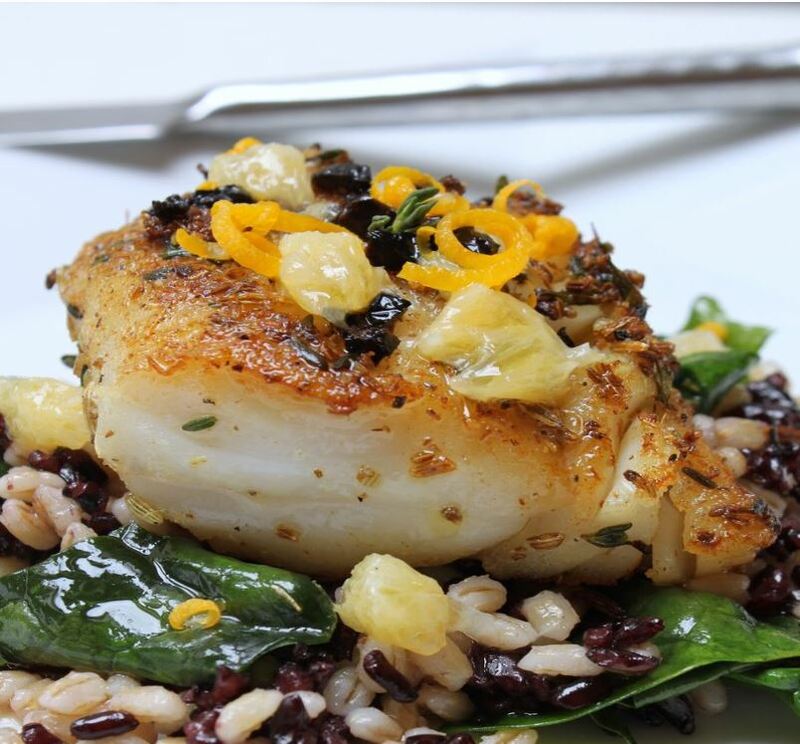 When the oil is shimmering, place cod in the skillet. Cook on each side for about 2-3 minutes, depending upon size, until slightly firm to the touch. Remove from heat and tent with foil. 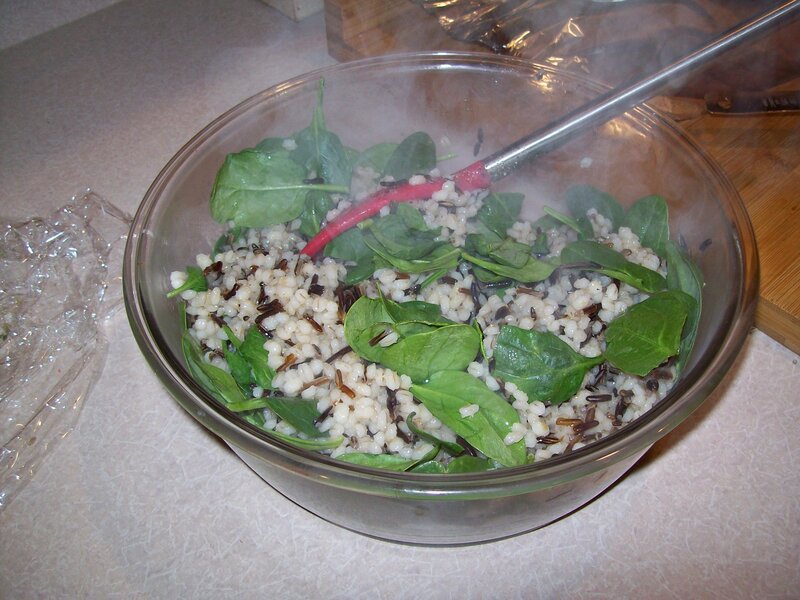 To plate, combine the warm barley, black rice and spinach and season with salt and pepper. Toss to combine and allow the spinach to lightly wilt. 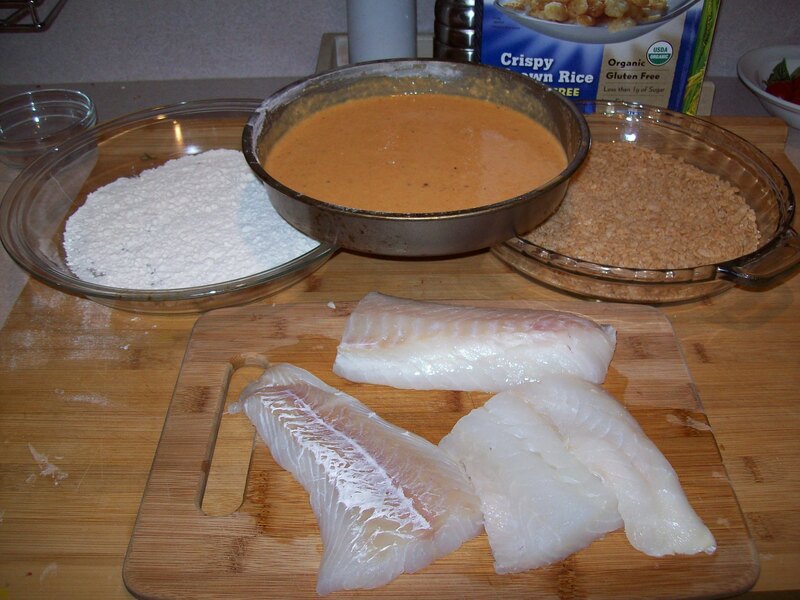 Place a couple spoonfuls on each plate and top with a piece of fish. – Steve: I sprayed a 1 cup measuring cup for me and a ramekin with a little oil and fill with rice mixture it formed a nice mound on plate. Drizzle a spoonful or two of the meyer lemon mixture over top and garnish with black olives and thyme leaves, if desired. Its funny how over the years food shopping have turned us in a Pavlov dog experiment. It does not matter what time we go shopping when we come back, after the groceries are put away we as starving. Must Eat!! Yesterday I did my typical roaming from the pantry to the frig looking for inspiration. 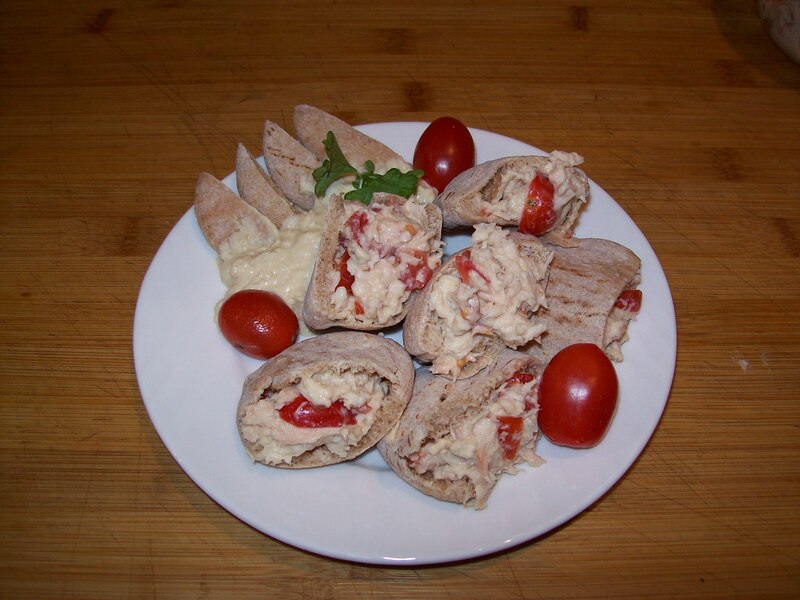 Lyn said why don’t you make some of Mikie’s (our son) hummus tuna fish. He turned us onto replacing mayo with hummus. Anway…..
Make or buy your hummas how you like it. Lyn had made some the day before. 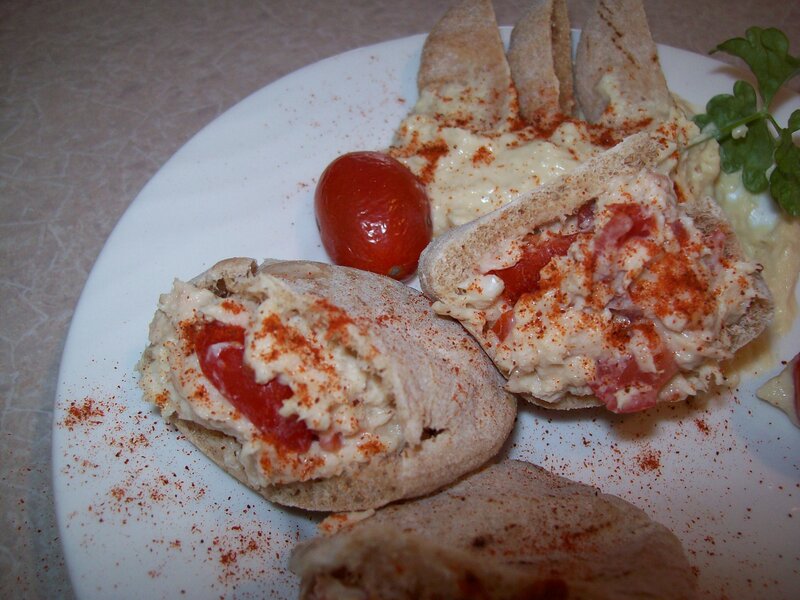 Cut the top off a mini pita round an set aside. Lyn also had picked some of those whole wheat mini pita rounds, although today we both admitted that the plain are better wheat seemd too dry – healthier but dry.